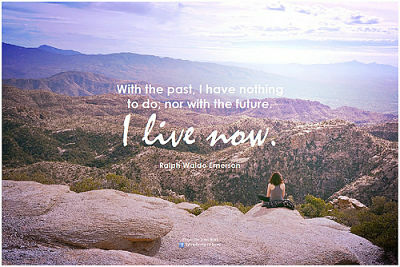 How to Live in Your Present? Seven keys to help you experience your present like you never have before. Living in the present takes work. It requires you to take action to cut out the unnecessary and simplify your life. When you decide to live your today in full effect you will experience life in a new way. The birds will sound clearer. The grass will look greener. The roses will smell fresher. You will see life the way it is meant to be seen. The one thing that scares me is to get to the end of my life and missed living. I don’t want to finish life with a list of would’ve, could’ve or should’ve. I want to enjoy living in my present moment. I am not discrediting that you don’t save for a rainy day. I am not saying you don’t institute plans for tomorrow. Nor am I saying that you will totally forget what happened in your past. But, I am saying you cannot afford to forfeit living today waiting for tomorrow or holding onto yesterday. I want to encourage you to live your best life today. Don’t wait for others to give you permission. Don’t wait for some expert to give you a special formula to follow. Don’t wait for everything to line up perfectly before you take action. Do not get to the end of your life and regret that you did not live in your present. You only get one shot at life and you cannot afford to mishandle it. 1. Take inventory.You possess unique gifts and talents that are specific to you. No one else in the world has what God designed for you. You have within you everything you need to get the job done. This does not mean you will not hit some bumps in the road or come up short on your journey. Take inventory of your life, find out your strengths, weaknesses, threats and opportunities. Once you find them out design a plan and take action. 2. Focus on today. You can take an ordinary magnifying glass and position it in a way to focus the rays of the sun and it will burn a hole in a board in a few minutes. If those same rays are not focused through the magnifying glass, it will only heat the board significantly. But, when the rays of the sun are focused through that magnifying glass it can do what it cannot do unfocused. Just imagine the power your vision can have in your life and those connected to you when it is focused on what is possible for you today. 3. Seek forgiveness. Don’t live your life frustrated and angry about what others did or did not do. Forgive. Life is too short to hold onto unforgiveness. It can be difficult to forgive someone who done you wrong, but the consequences of not forgiving weighs your life down. You miss living at your best and forfeit peace of mind when you don’t forgive. Free yourself by taking the initiative to forgive. Don’t waste another second, seek forgiveness and move forward. 4. Envision your future, but work hard today.It is okay to dream big. Set goals and plans for the future. But working hard today is the required first step you must take to realize your vision for tomorrow. Don’t allow dreaming about tomorrow replace living for today. 5. Stop holding onto yesterday’s victories. What you accomplished ten, five or two years ago was great, but it was for that season in your life. Today is a new day. You cannot live your present stuck on yesterday’s successes. If you are still talking about what you achieved yesterday then you have not achieved enough for today. 6. Stop worrying. Worrying does not add to your life, it only subtracts. It holds you hostage from living your best life. You cannot change what happened in the past. You cannot predict what will happen tomorrow. No amount of worrying will change your situation. You overcome worry by refocusing your thoughts, trusting God’s vision plan and doing what you know is right to do. You cannot fully appreciate today if your mind is stuck on yesterday and your eyes are focused on tomorrow. 7. Think differently. To live out your present, you must think differently than you did yesterday. Our world changes at such a fast pace that most of yesterday’s solutions are no longer the right answers for today. What occupies your mind and what you think means more to you living successfully in your present than anything else. If you don’t think differently than you did yesterday then your today will look like your yesterday. Question: What can you do to live effectively in your present moment? Leave a comment below.